Welcome! You have paid us a great compliment by allowing us to provide dental care to your child. Our office follows the American Academy of Pediatric Dentistry and American Dental Association recommendations to see children around their first birthday. 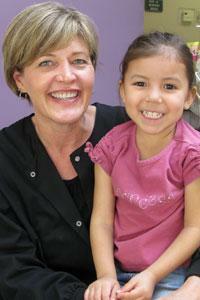 Our "dental home" is created to be an ongoing relationship between our dentists and your child. It is meant to be a resource for answering all your dental questions as well as monitoring growth and development. It will emphasize preventive dentistry, make referrals when appropriate and provide your child with a familiar setting in case of emergency. Having a dental home enhances the dental professional's ability to assist children and their parents/care givers in the quest for optimum oral health. 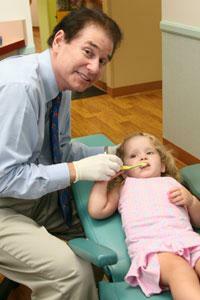 The establishment of a dental home traditionally begins with the age 1 visit. This is especially important because it introduces your child to our dental team. Early dental visits allow the dentist to discuss proper infant oral health care, teach lifelong habits and takes preventive steps to avoid cavities. The age 1 dental visit begins when our new patient coordinator greets you and your child in the reception area and escorts you to a private room where we can get to know you both. After reviewing your needs and questions, she will introduce the doctor to you. We will discuss growth and development, feeding and oral habits. At this visit, we will also perform an oral screening, provide you with oral hygiene instructions and discuss pacifier, finger or other oral habits. Traditionally, this visit is done with the child laying on mom or dad's lap. The first dental visit begins when our new patient coordinator greets you and your child and escorts you to a private room where we can get to know you both. After reviewing your needs and questions, she will introduce you to the doctor. While the doctor and parent are talking, the specially-trained coordinator will take your child to get a toothbrush and begin the visit. The coordinator will begin "show and tell" with all our dental instruments. We encourage the child to actively participate in the visit by asking questions about school or daycare, hobbies, friends or anything special they would like to share with us. Parents are encouraged to "sneak-a-peek" during the visit - seeing is believing! Mom and Dad are usually amazed how wonderful their children listen and behave during the visit. Occasionally, a child may cry during some part of the visit. This is normal behavior and usually the child will work their way through it with our compassionate coaxing. The first visit consists of a complete dental exam and cleaning. This includes checking for cavities, gum disease, checking the bite for correct alignment of the jaws and checking the development of the teeth. X-rays will be taken based on the needs of your child. The appointment also includes a final consultation to address any further questions or necessary dental treatment. Every appointment ends with a special photo of your child with the doctor and a trip to the toy tower for a job well done! Our entire team is dedicated to providing thorough and gentle dental care. We strive to make each child's dental visit as pleasant as possible. You can play a large part in preparing your child for his/her first visit to the dentist. We would like to make a few suggestions to prepare your youngster for the initial visit. First, present the visit as an exciting experience for yourself and for your child. Second, tell your child that we will "count," "brush," and "take pictures" of their teeth. By explaining the exam and the cleaning in these terms, your child will better understand the situation. Try to act relaxed and at ease. Your child will probably sense any anxiety on your part. Avoid negative phrases such as "hurt," "drill," "pull," and "shot." The office makes a practice of using words that convey the same message but are pleasant and non-frightening to children. It is important to be positive regardless of the parents' past dental experiences. This initial examination involves nothing uncomfortable and should be perceived by the child as non-threatening. It is our job to make this the most positive experience possible.